February 23, 2012  Details are still coming in about the incident. The Marines were on a nighttime training mission. January 13, 2012  The images that appear to show four Marines urinating on the bodies of Taliban fighters could spark an uptick in violence in parts of Afghanistan where U.S. forces have made gains in recent years, officers worry. January 11, 2012  It appears to show four U.S. Marines urinating on the bodies of three dead men in Afghanistan, but has not yet been verified. Regardless, "it's hideous. It turned my stomach," says Pentagon spokesman Capt. John Kirby. 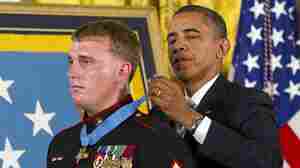 December 15, 2011  While Dakota Meyer "by all accounts deserved" to be nominated for the award, many of the claims about his bravery were exaggerated, according to McClatchy Newspapers. November 22, 2011  John Catherwood from Laramie, Wyoming called in to Talk of the Nation. He thanked Marine Jake Romo for his service, then remembered his nephew, Lance Corporal Alec Catherwood, who was one of the Darkhorse Marines killed. 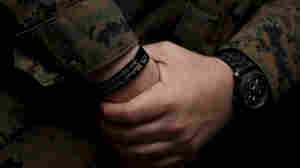 Petty Officer 3rd Class Matthew Nolen, a corpsman with Company L, 3rd Battalion, 8th Marine Regiment, wears a memorial bracelet or KIA (killed in action) bracelet in honor of his fallen squad leader Cpl. Michael W. Ouellette, who was killed during a patrol in Afghanistan. October 18, 2011  Commanders had banned the wearing of such memorials. But Commandant Gen. Jim Amos is changing the policy, Marine Corps Times reports. Many Marines were upset about the ban. May 2, 2011  NPR's David Gilkey, embedded with Marines in Afghanistan, asks a few men what they think of the news. September 21, 2010  Obama's choice to lead the Marine Corps says repealing Don't Ask, Don't Tell would hurt morale. July 26, 2010  The Marine Combat Art Program sends U.S. troops into war to paint. 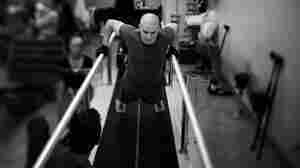 Now, the future of the program is in question. 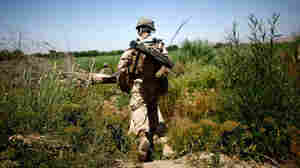 July 12, 2010  Marine general upbeat on sudden change of governor in Marjah, Afghanistan. 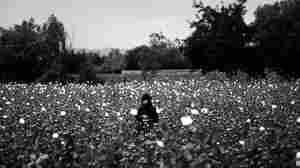 April 13, 2009  An intimate and anecdotal look at the Afghanistan army, courtesy of The Guardian.